In one-week, this Just Between Us Journal has already changed my relationship with my daughter. So much is happening to girls at this age. And, unfortunately it’s happening so much faster than it used to. Sometimes [my daughter] seems so mature and confident, I forget everything she’s navigating. I’m reminded that she’s still young girl trying to understand her physical and emotional changes when I read an entry in which she asks about something I know she’d be too embarrassed to say — and absolutely mortified to have to listen to my answer. Writing makes it easier to broach some topics — but I have found once we’ve “talked” on paper, continuing the conversation in person is comfortable. As moms of teens, we need to pause and consider, “Did she stopped talking to me because she’s not sure how to comfortably open up to me?” Sometimes old ways of communicating (like face-to-face chats) need to be worked up to during these formative years. If you’re not sure how to communicate with your teenage daughter lately, this mother-daughter journal is a great tool. When you talk to your daughter in a way she feels comfortable with, well, even the most reluctant teen will open up. In other words, this Just Between Us Journal helps your tween or teen to speak up about things that are heavy on their hearts. This journal includes writing prompts to help get the conversation going, plus fun ideas for making lists and drawing pictures. There’s also plenty of free space for writing about day-to-day experiences and whatever’s on your minds — and two ribbons for marketing your places. I bought two of these Just Between Us Journals, one for each of my girls as tweens. 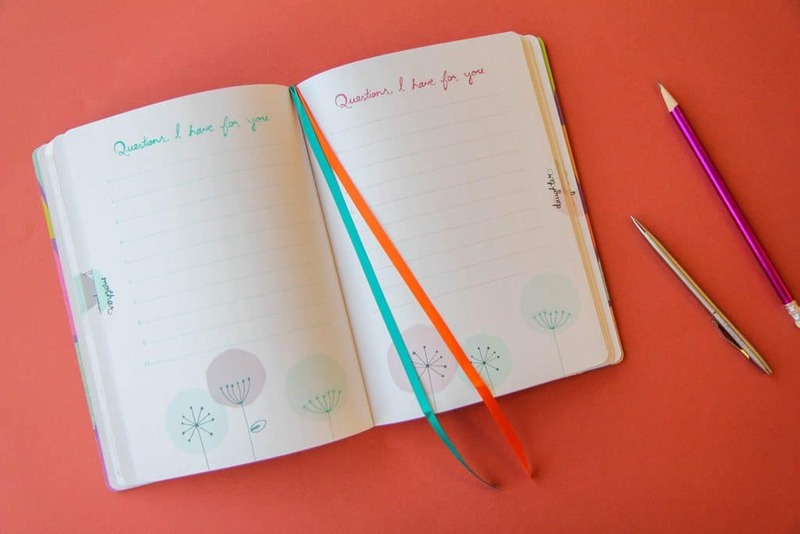 I loved the idea of having mother-journal prompts to help get us started. I thought I was proactive in getting this journal. When we got started, I assumed we’d kick it off with filling in some of the playful fill-in-the-blank prompts. I couldn’t have been more taken back by what my girls wrote with their first entries. At nine and eleven, my girls already have weighty topics on their hearts. One of my daughter’s had been privately holding onto a heavy school situation that just took my breath away. Being able to write the story and get it all out seemed to alleviate a huge amount of stress for her. So many things are changing with our girls right now. We need to find ways to keep the lines of communication open as we head into these transition years. Our girls need us more now than ever. 1. Plan a special mother-daughter date with your daughter. My little lady and I headed to Big Water Coffee (in our favorite place — Bayfield) and ordered hot cocoa, coffee, and a treat. The goal of this private date? To sit down and talk about how this whole mother-daughter journal would work. It may seem unnecessary to have this chat but to ensure success; you need to make sure you’re on the same page. 2. Find a cozy corner and read the intro to the book together … out loud. In the intro of the journal, you’ll find two important sections: A Mother’s Perspective (mom-to-mom talk) and the A Daughter’s Perspective (teen speak). Both helped us immediately see each other’s point of view and opened the doors of communication. This was beyond helpful in getting the conversation rolling. Quick tip: Being a reader or a listener for too long can lead to a wandering mind. We took turns reading every other page to ensure we were both engaged. Without having read these two intro sections together (and out loud), I genuinely do not believe we’d have had such a strong start to our journaling relationship. Again, this section seems like a lot considering journaling feels intuitive. The point is to slow down and show your daughter your commitment to her and your mother-daughter relationship. Don’t skip this getting started stuff! Who is allowed to see this book? How will you pass the journal back and forth? How are you going to address each other? What are you going to use to write with? 4. Perhaps the most crucial aspect of the book is discussing the suggested guidelines below with your daughter. If you want your Just Between Us Journal to be successful, you’ll need to both follow these (sometimes challenging) guidelines and build a sense of trust. 5. Make it playful. This mother-daughter journal doesn’t have to be just about teen angst. There are many relationship building activities, and fun prompts too. After our mother-daughter coffee date, we went to the store and bought a few special colored pens for journaling. Simply having special pens, made the experience more meaningful to the girls. Sometimes in life, it is the little details that matter the most. The experience since our original date to start the Just Between Us Journal has been eye-opening, wonderful, and at times overwhelming. The first night, one of my daughters wrote an eight-page entry. She had so much weighing on her. I didn’t realize how many grown-up thoughts were going on in my little ladies’ minds. I am so thankful to have a tool to comfortably discuss these topics with my girls and occasionally take some of our chats off the page, into our day-to-day conversations, and allow her to open up to me. I think journaling is especially important as we both become busier. The time we have to sit and talk becomes less and less each year. And yet, as she moves further into the her teenage years, I need her to know that she will always have a way of communicating with me. I couldn’t agree more. I am so thankful for stumbling upon Just Between Us: A No-Stress, No-Rules Journal for Girls and Their Moms. I just had to share with you. As we continue forward, we might eventually move on to using a more traditional blank journal for writing. That being said, having Just Between Us Journal as a getting started guide to help us through this getting-started process has been priceless. If you have any questions about the book or our experience with the mother-daughter journal so far, please don’t hesitate to ask questions in the comments. If you take the webinar, pop over to Facebook and let me know what you think! UPDATE: Quite a few people on Facebook asked about a mother-son journal. 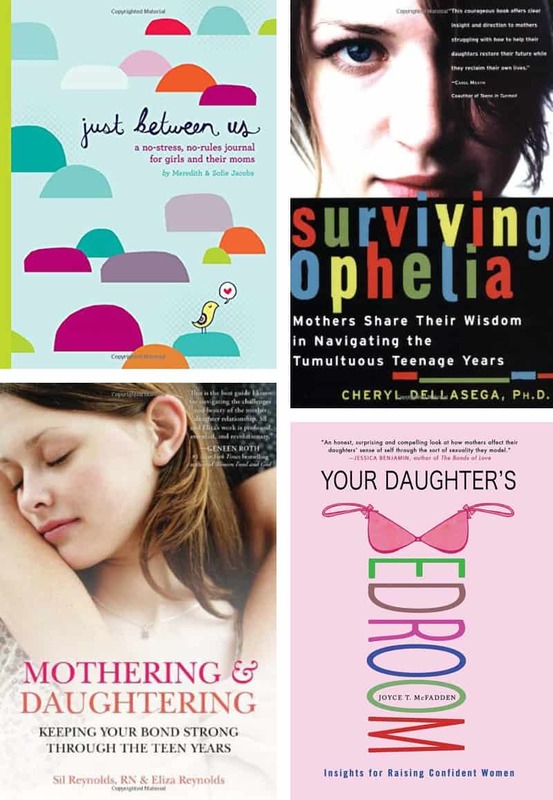 A few parents have recommended this particular one: Between Mom and Me. 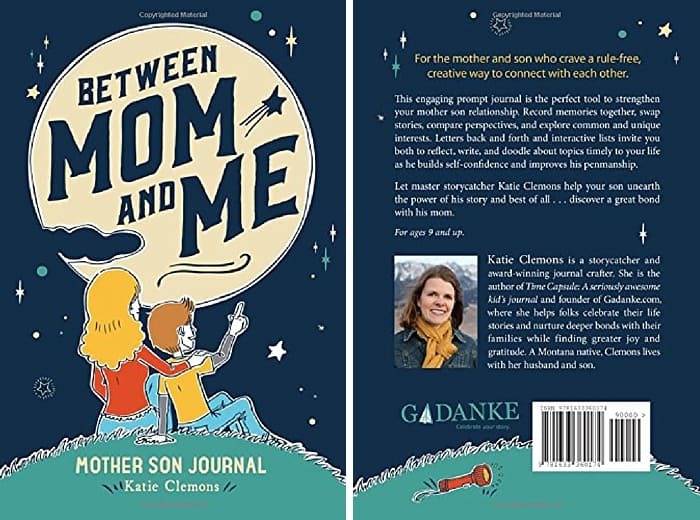 Pop over to Amazon (4.5 out of 5 stars) and read a few of the reviews moms have left about the journal. This engaging prompt journal is the perfect tool to strengthen your mother-son relationship. Record memories together, swap stories, compare perspectives and explore common and unique interests. Letters back and forth and interactive lists invite you both to reflect, write and doodle about topics timely to your life as he builds self-confidence and improves his penmanship. Let master storycatcher Katie Clemons help your son unearth the power of his story and best of all . . . Discover a great bond with his mom. I also thought I’d share a couple parenting books on my library list too. I’d love to know if you’ve read any of them already or if you have more suggestions for me. Let’s chat in the comments. Thank you for sharing this Zina! I’m adding this to my Amazon wish list – something like this would work so well with my oldest daughter. Thank you! I will have to try this! We tried our own mother daughter journal and they loved the idea but the girls were not great about keeping it going! I didn’t want it to feel like a chore so I let it go! Now I think they just use them to doodle in! I would love to get this going again! Especially because my 11 year old doesn’t seem to want to talk about anything!!! You know, we did something like this very informally, and more on the humorous side, rather than the “building a relationship” side. Our whole family had one little notebook that we were scribbling notes and pics and stories in. It was a lot of fun and something my grown up girls still remember from their youth. I love this journal idea! do they have one for boys and their moms, daughters and their dad’s, sons and their dad’s, and one for wife/husband and their wife/husband. I have 2 sons who are 15 and 17 years old. I would love a mother and son journal guideline. I think the journaling idea is wonderful! I occasionally write them notes or send a thoughtful text. I usually get back “ok” or “stop it”. I’m really interested in dong a more traditionally blank version of this and I was wondering if you could give examples of the prompts? I love love this idea!! I’m wondering if you might have some insight on what age would be appropriate for this specific book? I have a 7 year old (almost 8), she’s mature for her age, but wondering if this might be a bit much for her? Trying to decide if a regular notebook would be a better start for us. If you could give some insight I would be very grateful. Thanks for your time. Yes! I have this same question! I love your ideas on how to make this journal work. As you know, my two girls are also 9 and 11… and I’ve been wondering about trying this journal with them. Your tips are really helpful. I am over the moon excited about this. I was so happy when I saw the post because I thought it would be super fun for my daughter and me when she gets older. She’s only 3 now… As I was reading the article, I was wondering if there was a mother/ son version since my boys are older, and I think 2 of them would be at the perfect ages for this. Sure enough, you included one. I’m really looking forward to starting this with my sons! Thank you! I am over the moon excited about this. Thank you! Will you be posting any replies to comments? To jot down the research like essay, coursework or papers seriously isn’t frequently | fearing lest she really should not business scheme creating companies contain the time burn them. It is very nice article and the info given by you is very important. Great article. We play a game called “Rose and Thorn” at dinner each night. She has to name something negative that happened and something positive that happened. It starts a great dialogue. I love this idea. For me, journal will be better than talking. I will definitely buy this mother-daughter journal. Thank you for sharing. “Hello, I love your board and i’d like to be part of it and i hope you benefit from my pins. (I hate spam and love an educational pins). Sometimes daughters tend to be shy to speak. They behave like strangers with parents. This journal sounds interesting and very helpful. High quality content. Best regards.